This project will give you a pleasant way to decorate your home during Halloween! Pull out 3 prints from the stack and the black cardstock sheets as well. 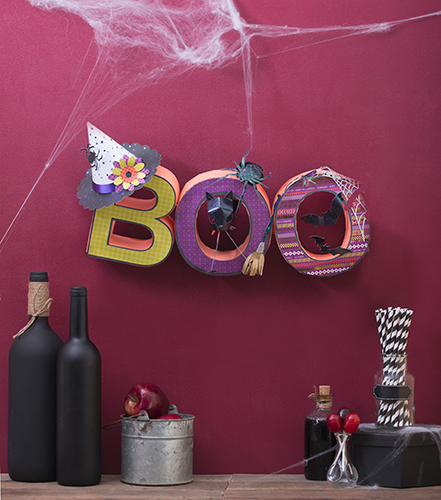 Use the “BOO” letters as a template and put each one facedown on the back of the black cardstock sheets. Trace around the outside and inside sections with a pencil and *cut them out. *Use the craft knife to cut out the inside sections if desired. Take the black cardstock letters and put them facedown, one on the back of each print. Trace around the outsides and then cut them out inside the lines (*they need to be ¼” or more smaller than the black letters). Adhere the printed letter to the center of each respective black letter. Set these aside. Paint the top and inside of each paper mâché letter with the orange paint (*depending on the color of the paint and desired outcome, more than 1 coat may be necessary). Set these aside to dry. Pull out the DIY project stack: Hats, Cats, and Bats. Using the directions in the stack, create desired hat combination to go on the “B”. Cut out 2 spiders, each in a different size from black cardstock (prints or solids). Assemble the medium cat using the directions in the project stack. Assemble the orange bow and adhere it in place on the neck of the cat. Cut out a spider web using the silver glitter cardstock sheet. Create a broom from a piece of black cardstock (use a spare piece of the black holographic cardstock around the cat pieces), making the handle and broom section. Cut 2-3 pieces to cover the broom section from the gold glitter cardstock. Fringe cut the glitter cardstock pieces at the bottom to give them a lifelike look. Wrap a section of twine between the glitter cardstock and the black handle several times, securing the start and finish of the twine behind the broom. Remove 2 bats from the DIY stack (smaller-sized ones). Fold as desired. Once the letters are dry, adhere the groupings from step 1 to the center of their respective letters. Adhere the hat onto the left side of the “B”. Adhere the large pompom slightly off center of the middle “O”—add a spider to the top. Adhere the broom to the same side, bottom section, as shown. Adhere the spider web to the top of the last “O”. Adhere the remaining spider and the 2 bats where desired to the last “O” as well. Add the cat to the middle of the middle “O”; display and enjoy! Party guests (and trick-or-treaters!) will love this whimsical decor!